Arnie Grape is a part of a family living in a small town. He is mentally retarded and is known by the town for his various stunts he pulls such as climbing up the water tower. Arnie's brother, Gilbert, is his main care taker and best friend. Arnie likes to play games with his siblings like hiding in a tree and trying to make them find him. He shows his handicap in various ways during the movie. Arnie has random outbursts of yelling or repeating peoples statements over and over again. He is unable to bathe himself and when Gilbert tries to make him, Arnie ends up spending the night in the bathtub, unsure of what to do. Arnie has to have things explained to him in ways he understands. For example, at the end of the movie when Arnie's mother passes away, Arnie has a hard time understanding what happened. He thinks she is simply playing a game with him. Arnie runs away a few times during the movie, and Gilbert has to search the town for him. He is usually in the middle of a group of locals as well as police officers trying to coax him down from the water tower. Arnie gets confused easily also. When his family was planning his birthday party, Arnie was getting upset because he did not have a role in the planning. They had to calm him down and let him know that his only job was to show up at the party. At the beginning of the movie, his family stated that he was not supposed to live a long life, and, instead, he was supposed to pass away before 13. Miraculously, Arnie makes it to his eighteenth birthday party. Arnie is an interesting and lovable character, and he shows strength and courage in making his life as comfortable as possible. 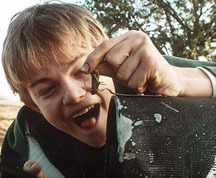 Below is a trailer for the movie What's Eating Gilbert Grape? where you can see a few scenes where Arnie's disability is portrayed in the film. After doing research, I would say that Arnie's portrayal of an individual with mental retardation is completely accurate. Arnie has several moments where he shows his infantile behavior. He is almost 18, yet Arnie plays hide and seek with his siblings on a constant basis. He runs away from his brother, Gilbert, more than a few times throughout the movie. Arnie is also found climbing up the water tower in his town and is taken to jail by the police officers. He also tends to repeat what people say quite a few times. At one point in the movie, Arnie ends up screaming that his dad is dead because of the way Gilbert talked about it. He continued to repeat Gilbert over and over until he began screaming the line at the top of his lungs. Arnie's slowed learning skills are definitely apparent in this movie. He cannot bathe himself because he does not know how to do it. Gilbert is responsible for giving Arnie baths, but at one point, Gilbert tells Arnie to finish his bath himself. Gilbert comes home to find that Arnie stayed the night in the bathtub because he was unsure of what to do. After that experience, Arnie refuses to take a bath or touch water for a few days. His frequent trips up the water tower also show slowed learning skills because he does not learn from his mistake the first time around. At the end of the movie, Arnie's mother is laying in her bed and ends up passing away. Arnie finds her and is confused why she will not wake up. He tries very hard to get her to "stop playing" with him. Arnie seems to be very curious with different things throughout the movie, which is the only behavior that clashed with my research. According to my findings, it says that the lack of curiosity is a main symptom of mental retardation, but Arnie is intrigued with most everything he sees. He stares at a mailbox intently while he opens and shuts it towards the beginning of the movie. He also questions his family quite a few times in the movie such as when they are discussing the plans for his birthday party. Arnie gets upset because he wonders why he cannot help plan his birthday. Overall, this movie was a great portrayal of an individual with mental retardation.